After going shopping with Matt on the weekend and hardly buying anything I went back in on Tuesday I did much better. You know it's a good shopping trip when you come home with two pairs of shoes. Most of the things I bought were boring work clothes but there were a few gems thrown. I've used these for the last two days and I'm seriously impressed. My skin has been really quite oily for the last month or so (thank you hormones!) but I've noticed the difference in how well my make up stays put and the pressed powder has really helped how my skin looks. Thanks to the 2 for 3 offer currently in Boots I got the cheaper of the two free. Both shoes are from New Look, the black shoes were £15.99 and the others were £19.99. I can't decide whether to keep the shoes on the right, they look ok with trousers but not with a skirt/dress. They're suitably smart for work though which I like, what to do? These beauties were flung over the back gate when I got home. I love them! I can't wait to wear them out tomorrow, they make me almost as tall as Matt. I was really surprised by this blouse, I saw it on the hanger and wasn't overly thrilled with it but when I tried it on I fell in love with it. It's from Marks and Spencer too! I can see it looking great tucked into a pair of jeans and worn with wedges. 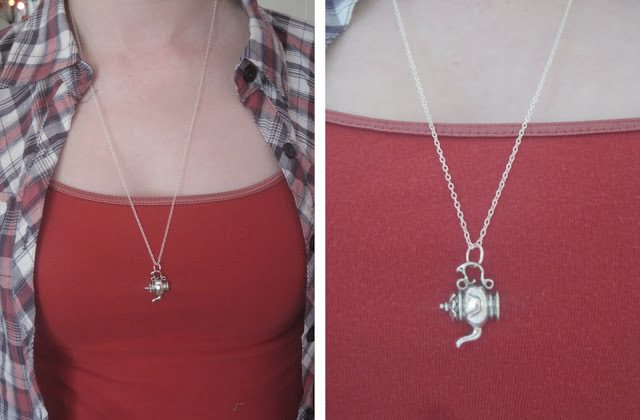 Yesterday was a great day for parcels arriving, my E.L.F order arrived along with two necklaces from Sunken Rose. How cute is the teapot? It's my new favourite necklace which I put on as soon as it arrived. By the time this posts I'll be back in town buying the things I forgot to buy on Tuesday. Looks like my shopping mojo is back!